Just as fine wines are made from a vast variety of grapes that determine their flavor, so also fine olive oil is made from a vast variety of olives that produce distinct differences in flavor. Some oils are made from a single fruit, such as Siurana from the arbequina olive. Other more complex oils are made from several types of olives. The actual proportions that make a specific oil unique are a closely guarded secret. An example of this are the oils of Nuñez de Prado and Señorío de Vizcántar which are made in neighboring towns and list the contents as essentially the same varieties of olives. Two hundred sixty-two varieties of olives grow in Spain. No, don't worry; I will not confuse you by talking about all of them! I have listed some of the better-known olives that are used in the selection of Spanish olive oils that we offer. These olives are grown in Lleida and the surrounding valleys of the Pyrenees Mountains in Cataluña. The trees are not a very vigorous variety, and because of the very small size of the fruit, it is difficult to harvest mechanically. Arbequina olives produce a pale yellow to greenish color oil, which is delicate and fruity with the slightly bitter quality that Spaniards enjoy. It is best stored in a cool dark place because of its high proportion of healthful (and fragile) polyunsaturated fatty acids. This oil is a wonderful garnish for a plate of crisp greens. It is also a favorite for marinated vegetables and grilled fish. Because of its delicate flavor, it is better not to use arbequina olive oil for frying. It is ideal for alioli and mayonnaise. Can Solivera Extra Virgin Unfiltered Arbequina Olive Oil:This extraordinary Can Solivera Arbequina extra virgin olive oil is the closest you will ever come to having your own private oil. It is made in limited quantities by a couple who are on a quest to produce the perfect olive oil - with no compromises tolerated. The initial flavor of this precious olive oil is buttery and a bit sweet, reminiscent of melon and apples. The aftertaste is warm and grassy. Its pleasing bouquet makes it the perfect oil to drizzle on a bit of crusty bread -- or to embellish a bowl of baby salad greens.Can Solivera Unfiltered Arbequina olive oil is obtained solely from the first cold extraction or pressing of the pulp of healthy arbequina olives. An ancient stock of olives grown for centuries in Toledo and Ciudad Real. The trees occupy 14% of the community of Castilla-La Mancha. It is a stable oil because it contains 77% monounsaturated fatty acids. As with the arbequina olives, cornicabra fruit is very difficult to pick mechanically and therefore is only used in fine oils. It produces golden fruity oil with greenish reflections, which tastes velvety, sweetish, and slightly bitter. It is suitable for dressing warm salads, roasted and stewed vegetables, and in uncooked sauces such as mayonnaise and as a marinade for game. An olive from the north of Spain in Aragon. The tree is straight and vigorous and the harvest is early, starting in early November. Ideal for mechanical harvesting, empeltre olives mainly produce an oil that ranges from pale yellow to old gold in color. It has a fruity, sometimes slightly sweet almond flavor with no bitterness. The smoothness of the empeltre oil makes it ideal for blending with other olive oils that are more pungent and bitter -- two attributes that tend to be unappreciated outside of Spain. It is suitable for salad dressings, and marinades. Mayonnaise made with empeltre olive oil is especially mild and delicious. A few drops of oil on manchego cheese give it a quite special quality. Tienda has such an aged manchego kept moist in olive oil, as has been done since Roman times. The name comes from the whitish (blanca) underside of the leaves, which gives the tree a silvery appearance from a distance. You may remember seeing this attractive tree if your travels found you east of Sevilla, south of Córdoba and across the north of Málaga. The fruit is usually large, plump and almost perfectly spherical. In addition to being used for oil production, Hojiblanca is served as a black table olive because of the firm texture of its flesh. You may witness the harvest from the end of November to late December. Once ripe the fruit is resistant to picking, which makes harvesting difficult. The oil yield is low. For these reasons it is used only in high quality oils. It has a very well balanced fatty acid content with a high level of oleic acid - about 77%. The oil composition of the hojiblanca olive is ideal from a dietary standpoint in that the 7-8% lineaic acid content is equivalent to the percentage in mother's milk. Hojiblanca has a tremendous range of flavors, but the most characteristic one is sweetness when first tasted, followed by a slightly bitter almond aftertaste. This oil brings out the flavor of fried foods such as chips, calamares and fish, and enhances the qualities of sautés and casseroles. Ideal for pastries and baking, it gives exceptionally workable and light doughs. This is the most important variety in the world accounting for 50% of the Spanish olives and therefore 20% of the world's olives. In spite of these figures, its use is not very widespread around the world, being grown only in the Spanish provinces of Jaén, Córdoba and Granada. The trees start to fruit early and the high yield is one of the main reasons for its popularity. The oil is of excellent quality because of the fatty acid content and the amount of natural antioxidants. It usually contains about 78-80% of monounsaturated oleic acid, which is important for avoiding cardiovascular disease. The oils tend to have a lot of body with some bitterness, and a pleasant fresh flavor. Very suitable and traditionally used for frying as it behaves well when heated, for meat dishes and for stews, all of which accept its vitality well, but equally good for salads and gazpachos. Picual is often blended with picudo and hojiblanca. 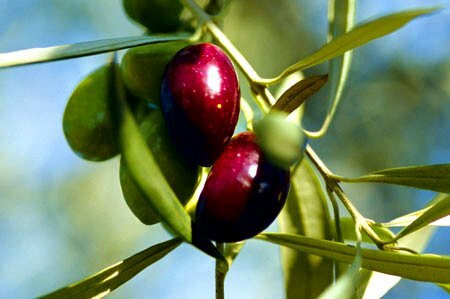 This olive gets its name from the pointed tip of the fruit. In some sections of Spain, it has the name Pajarero (birds) apparently because the sweetness of the oil in the ripe fruit encourages birds to peck at it. There are 60,000 hectares of Picudo olive trees in Baena and Priego de Córdoba as well as Málaga and Granada. The fruit is second in size for those olives used for oil.